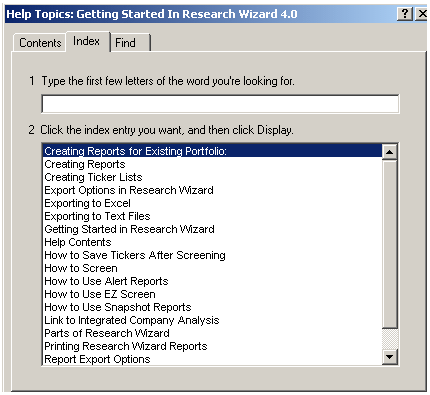 In this issue of Tips and Tricks, we’ll go over all of the helpful resources available for using the Research Wizard. The program is packed with valuable information, along with features and functions not found in other stock picking software. But it’s hard to know everything the program can do on your first sitting. In fact, a lot of its features may remain ‘hidden’ until you discover you need them or are ready to take your analysis to the next level. And we’re ready to help you find what you’re looking for so you can get everything you want out of the Research Wizard and more. 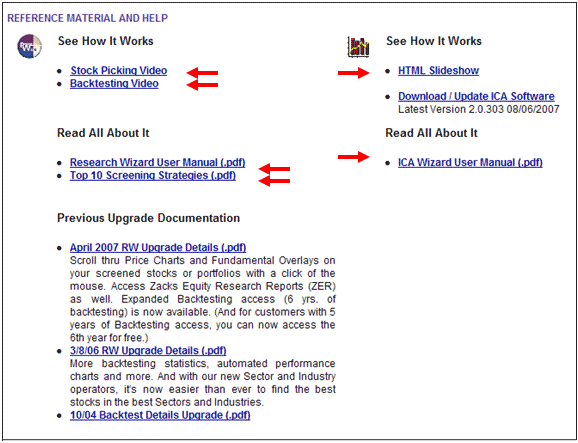 The first helpful resource that Research Wizard users have, are these Tips and Tricks articles. New ones come out every other week and we notify our customers via e-mail. Simply click the Tips and Tricks tab and you’ll be taken to the Tips and Tricks index. Consider bookmarking this page so you can go back to it again and again. 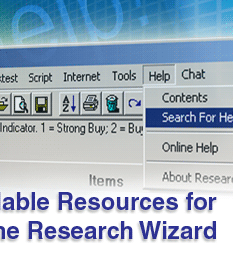 You can also access the Research Wizard site thru the Research Wizard program as well. 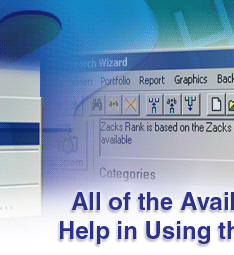 You can also access our Online Help guides from the Research Wizard as well. On the your Menu Bar, go to Help and a Menu will drop down. Type in your help topic or select from the available topics to get immediate help. 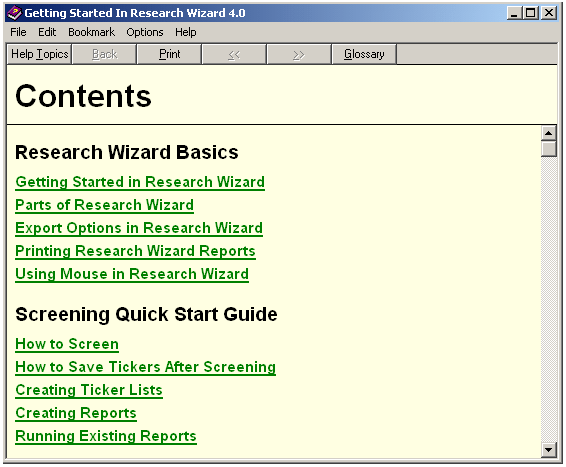 All of the features and functions of the Research Wizard are explained in this section. It is smartly laid out with detailed explanations and examples of how things work and how to get the Research Wizard to do everything you want. There’s also a User Manual on the site as a .pdf file. Open it up and read it online. Or print it out and keep it handy so you’ll always have quick and easy access to the do-it-yourself help that you need. 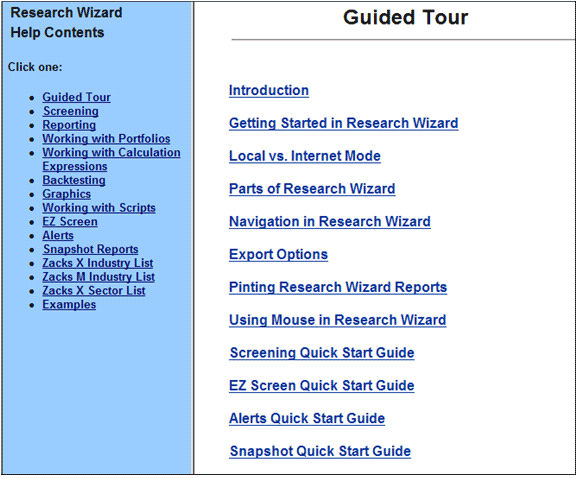 From the Research Wizard, you can get there by going to the Menu Bar, clicking on Internet and then selecting the Research Wizard Product Page. Once there, click on the Download Software tab. Then scroll down the page until you get to the Reference Material and Help section. There’s even a User Manual for the Integrated Company Analysis (ICA) program as well as a detailed ‘slideshow’ on how to use the program. There’s also three more videos (all rolled into one) on the Advanced Backtesting feature. This video walks you thru, step by step, how to use all of the features of the Advanced Backtester. Follow the instructions, and you’ll be a pro at it in no time. 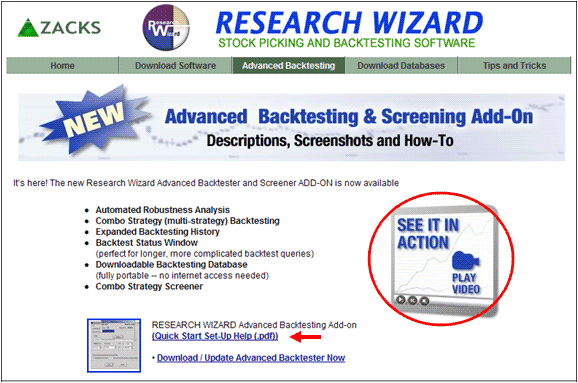 On that page, you find a written description on the Advanced Backtester, a Quick Start set-up guide, and the Advanced Backtesting video which will show you how it works. We’re also pleased to announce a new ‘Chat’ support feature as well. 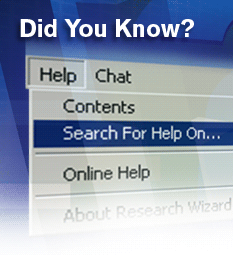 Within the Research Wizard, go to your Menu Bar and click on Chat. 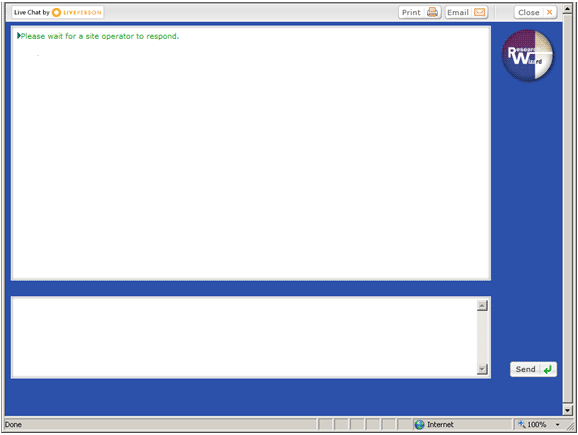 The Chat Window will pop up in a new Internet Explorer window. 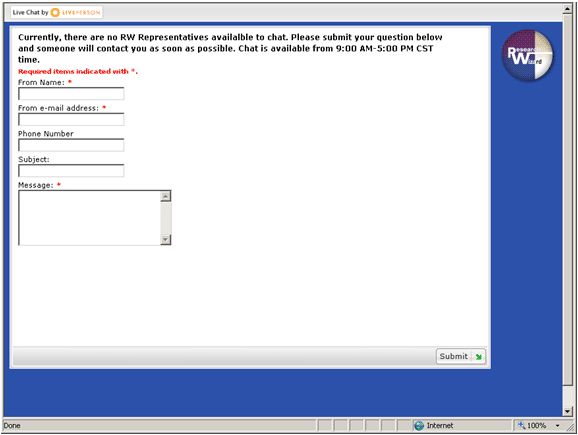 In the bottom window, type in your question, and a Research Wizard representative, will respond to you, providing timely and informative help. If you click on the chat feature during non-business hours (9 am to 5 pm CST), your chat question will be sent to the Research Wizard group via e-mail, where someone is likely online and able to respond to you even after normal business hours. Just type in your question, click submit, and your question will be sent to the Research Wizard group where somebody will respond asap. The phone will be answered by the first Research Wizard specialist. Of course, you can specifically call your personal representative who helped you sign up for the program in the first place. 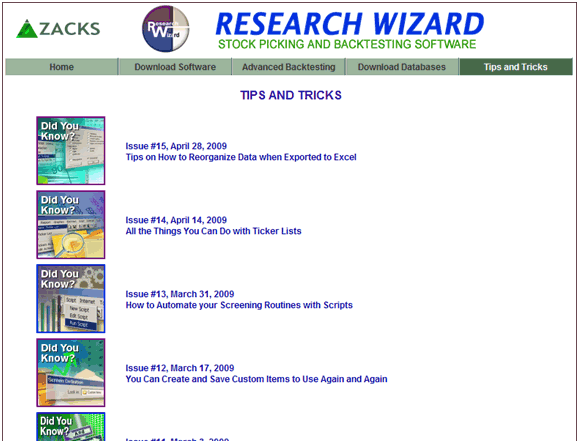 The Research Wizard is one of the most powerful stock picking, backtesting and research tools out there. But be sure you are also utilizing one of the most important resources you have as a Research Wizard subscriber – and that’s our expert and professional support staff and the numerous videos, articles and help guides available. And if you don’t see an answer on one of your questions within our resource materials, be sure to send us an e-mail letting us know what you’d like for us to demonstrate – right here in these Tips and Tricks. So make sure you accessing all of the helpful resources. And let us know how we can make our support center even better.